Carolina Energy Conservation installs rigid foam insulation for a variety of applications, including the attic, basement and crawl space. Rigid foam is a popular insulating product for its durability, high insulating value and versatility. Unlike fiberglass batt insulation, rigid foam boards never lose insulating value by settling or compressing. Foam boards shed water instead of soaking it up like cellulose and fiberglass insulation do and foam insulation won’t support mold or provide a home for mice, insects and other pests. If you're interested in upgrading your house with rigid foam insulation, call us at 1-855-410-0662 or click the link below to request a consultation and quote! We are the home insulation experts in Myrtle Beach, Charleston, Sumter and surrounding areas. Rigid foam insulation provides high insulating value with little thickness, but not all rigid foam performs the same. The experts at Carolina Energy Conservation can help you choose the best rigid foam for the area of your house that needs insulating. As a Dr. Energy Saver dealer, Carolina Energy Conservation has exclusive access to this innovative foam insulation product, as well as many other quality insulation materials. We would be happy to discuss which rigid foam insulation product would be the best solution for your home. Schedule a custom home energy audit to get a better picture of your home's energy problems or simply request a quote to upgrade your insulation. 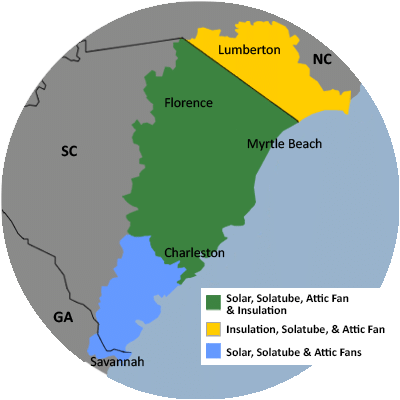 We provide complete energy-efficiency improvements and insulation services in Florence, Bluffton, North Charleston, Mount Pleasant, Beaufort, Goose Creek, Darlington and many nearby areas.